The truth is that college education is expensive. However that shouldn’t stop us from encouraging our kids to go to college. The most common reason for not encouraging kids to go to college is finances. Now let take look at the other side of the equation by comparing the the income gap, income gap over a career life span, and finally the tuition cost, all of these in today’s dollars and see if a college degree is worth pursuing. The income gap between a high school graduate and college graduate has been consistently widening. According to US News, “Among millennials ages 25 to 32, median annual earnings for full-time working college-degree holders are $17,500 greater than for those with high school diplomas only. Let us assume you are 25 years of age and look at too scenarios. (A) You are a high school graduate – you work for the next 35 years starting at $28,ooo per annum. You receive 3% salary raise per year over this period. 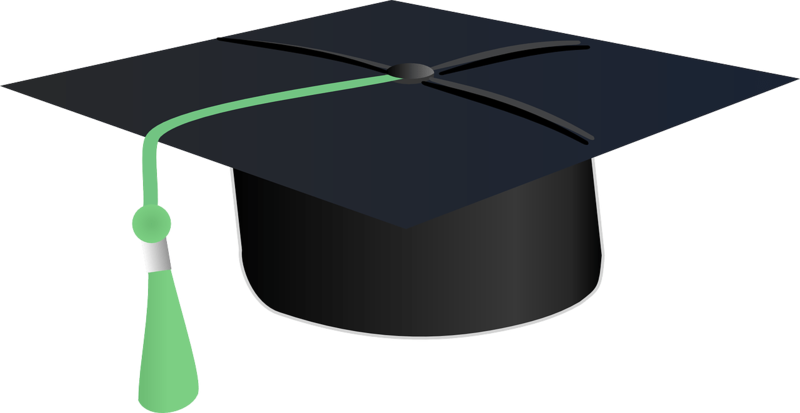 (B) You are a college graduate – you work for the next 35 years starting at $45,5oo per annum. You receive 3% salary raise per year over this period. The market interest rate during this 30 year period is 2%. You can do a time value of money analysis for the above scenarios and calculate the present value (PV) of your lifetime income in today’s dollars for both scenarios. For Option (A) the lifetime earning in today’s dollars is $1,201,813.75. 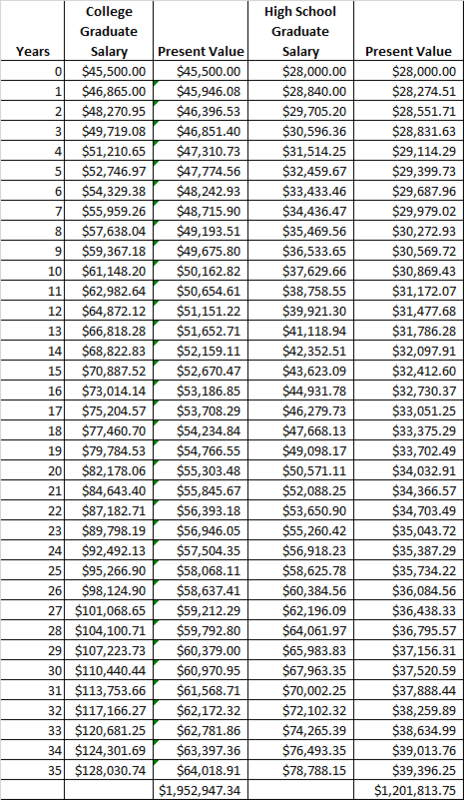 For Option (B), the lifetime earning in today’s dollars is $1,952,947.34. If you went to college, you would have earned an additional $751,133.59 in today’s dollars. If you are interested in the math, here it is. To understand this calculation, you need to first understand time value of money. The money spent on college education shouldn’t be frowned upon as bad debt. It should be considered as an investment into one’s future. Due diligence must be applied in finding a cost effective quality college education. For example, in today’s dollars, you could definitely get a college degree for less than $100,000. You would still be $650,ooo net positive. Tags : Should I go to College?